Tony Chi, who has designed several Michael Mina projects, designed Nobhill Tavern, which resembles an authentic San Francisco neighborhood restaurant. While its outside entrance is situated just far enough from the casino floor to keep its constant din at bay, it's close enough that you won't get lost in the cavernous hotel trying to find it. Outside of the restaurant are rectilinear wooden columns on which the name Nobhill Tavern is printed vertically; the columns feature pictures of the San Francisco neighborhood and a history of the hill. Up two small wooden steps is the slightly curvilinear glass entrance to the restaurant, which bears the restaurant's name in gold lettering. There's a hostess station outside to the left, before the stairs, and as you look through the majestic glass doors you'll immediately notice the warmth that's emanating from the walnut floor below and the sunset hued pendant lighting above. The bar is immediately to the left and the booth areas to the right. Upon entry into Nobhill Tavern's bar area you'll notice its vastness. Warm browns, beiges and sunset tones create a very earthy and very familiar feel within the room. The bar itself is very inviting, and very large; the American walnut bar, seating along with consists of leather backless stools, takes up nearly the entire lounge area. Bottles are housed in multiple wooden slatted cabinets with glass shelves that are perpendicular to the bar; as such, you can only notice them on an angle. 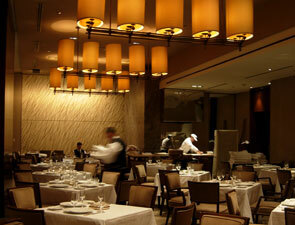 Over a dozen round covered lights are situated within a row down the middle of the lounge area, leading into the main dining area. Past the bar on the left is a round wooden table with comfortable oversized leather chairs. A freestanding floor lamp in the same fashion provides extra light for diners in this area. 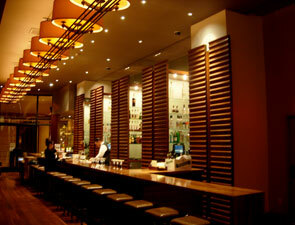 Spot lighting also illuminates the bar area. Behind that the bar is a wine cellar that's made of wood and glass. In fact, there is a second wine cellar through the dining room and outside of the restrooms; it's a cool glass room with wooden arches and racks that houses the red wines. The whites and champagnes are in the first wine cellar, at the front of the house. According to unconfirmed rumors, Nobhill Tavern's bar may undergo a redesign in December 2007; stay tuned.